The Aztec people had a very rigid and well-defined society. 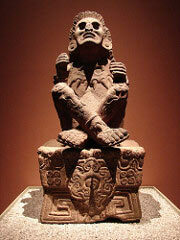 In fact, the Aztec society was comprised of a system of classes, including slavery. The common Aztec Indians were called calpulli. As they populated the area upon which they settled they formed clans, or tribes, of people who were interrelated. Each of these Aztec tribes was responsible for electing its own council and officers to keep order. They also regulated their own affairs and maintained their own records. As the Aztec empire grew, these calpulli tribes gradually became political divisions within Tenochtitlan. Over time, the people within each tribe were no longer related to one another. Yet, each calpulli ran their individual schools, councils and temples. When the city was founded in 1325, there were 15 different calpulli groupings. By the 16th century, this number had increased to 80. Within each calpulli, the Aztec people chose four chief officials. Of the four, one was chosen to be the overall ruler and was called the tlatoani. When Tenochtitlan ultimately became the primary hub of Aztec civilization, its ruler became the ruler of the entire empire. All other rulers were expected to pay tribute to this supreme ruler, called the huey tlatoani, or “great lord.” The huey tlatoani was considered to be a descendent of the Aztec gods and, therefore, semidivine. Specific Aztec people, such as the nobility, warriors, and priests, were responsible for supporting the ruler. The commoners, who included artisans, soldiers, laborers, farmers, and merchants, were expected to support the nobles. The merchants, or pochteca, formed their own hereditary class. They formed gilds and lived in special quarters. Therefore, they received several privileges over other commoners. Farming was an important business for the Aztec people. In fact, many of the nobles and rulers owned land in private estates. Tribute was paid by the landholders to the empire by farming and using the money earned to finance public projects. In addition, all Aztec men were expected to perform military services for the empire. Aztec women, on the other hand, were expected to stay home and take care of the family. They still worked hard in this role, as the Aztec culture was one built on hard work from people of all ages and both genders. In fact, citizens were expected to help in the building of dikes, temples, roads, and aqueducts. The class system of the Aztec people was very strict. It was, however, possible for the Aztec people to move within the class system depending on the contributions they made to the Aztec society. Capturing hostages was the primary way to move up in class, though some were also allowed to study and move up within the system. In addition, Aztec people could move down in the system by committing a crime or failing to pay a debt.